I've only ever spun natural colored fiber and frankly, I've been feelin' the itch to get a little colorful with it. Maybe it's the change of season maybe my secret love affair with variegated and speckled yarns is coming to a head, I don't know but all of a sudden all of the bright roving braids I see at my LYS are so very appealing. As much of a "slow fashion" proponent as I am, let's face the facts that I've grown up in an instant kind of world so I can sometimes be a bit of a "need it right now" person - so the other night I decided that if I wanted to play with a dyed fiber I might as well make do with what I have on hand and dunk some of the remaining BFL in tea and see what happens. Lucky for me, we've got a big stock pot in our pantry that I filled a little less that 3/4 of the way full and dropped a bunch of black tea bags in it and a tiny bit of salt (cause that's a thing?) and went on my merry way. Now, in no way do I consider myself someone who knows how to dye things so this was a true experiment. That said, I do remember using tea to stain?dye? paper in elementary school to give it an "antique" look so in a rudimentary kind of way I knew that tea could be used to change the colors of things in spite of my lack of knowledge on the topic. Anyways, I brought the tea and water to a boil, pulled it off the burner, and then dunked the fiber in it. The fiber looked real dark in the pot, and I figured that a lot of that color would wash out considering that tea isn't really a super high quality dyestuff. After letting it soak overnight I pulled it out, rinsed it with some vinegar, and hung it to dry out on our back porch. In all honesty, it sort of looks like the hair on a bog body - kind of a weird brassy orange. Good news is that I think it looks cool, but if I were a person who wasn't super into earth tones I would throw it out and call this experiment a failure, lol. 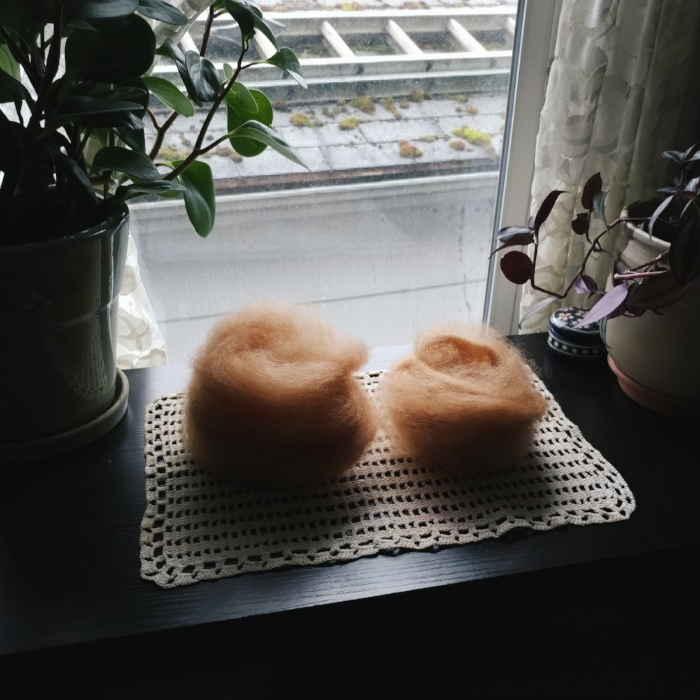 While watching the fiber change color was really fun, what was most remarkable was how much the hand of the fiber changed after soaking in tea. Granted, this combed top was a bit sticky to spin with from the beginning, but after soaking overnight in black tea it became real sticky. So much so that it was kind of challenging to pre-draft before spinning and a bit difficult to wrangle it onto the bobbin. 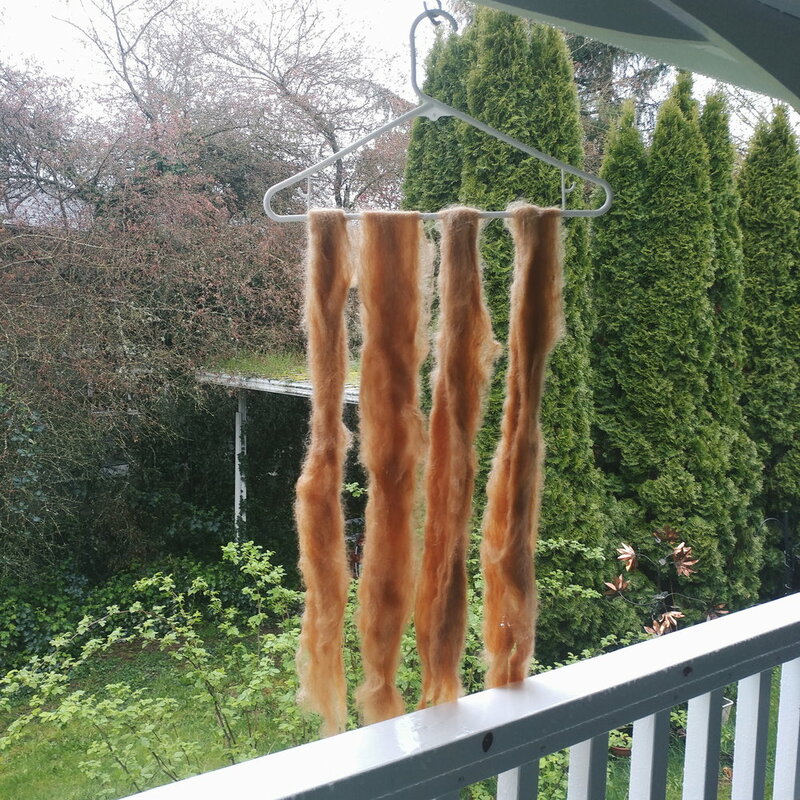 I didn't dye enough fiber to make anything substantial, but that's okay because really I was just wanting to satisfy my "gotta have it now" urge and do a little exploration of a craft well outside of my current wheelhouse. All in all I'd say this was a success. Any suggestions for what dyestuffs I should try next?